One of the inconveniences of summer is how to deal with a pet that loves to be on the go with you when extreme weather threatens his or her safety. My husband and I are rather indulgent pet parents. Our dog visibly deflates when I pick up my purse (a sign he has detected that means we’re going out) and tell him he has to “watch the house,” so we tend to take him along. We’ve found stores where he is welcome and restaurants with outdoor seating where he’s allowed. We’ve found many waiters bring him a bowl of water (although we get him one, if they don’t), and many drive-thrus (like the pharmacy and the bank) give him treats. We also carry a water bowl in the car. We asked our Facebook friends to comment on how they keep their pets safe while running errands in the summer. 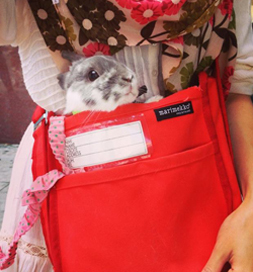 This bunny hops into his tote to “run” errands with his “mom,” Meredith N.
Nearly 100 percent of you said you leave them at home with the air conditioning running. Brenda A. uses fans to keep her pet cool and also gives him a chicken broth ice pop. Vera B. makes sure a human is in the car with her pet at all times — with the air conditioner on. Brenda A. says her dogs will be staying home while she runs her errands. “Better safe than sorry,” she adds. Our summer safety tips can help make you aware of dangers, so share tips on your Facebook page.